Ive been involved in various areas of online marketing since 1997. Ive made money from selling hard goods (stuff that has to be shipped) as well as digital goods. Each has its own set of challenges, advantages and disadvantages. Like I said, Ive been through the trenches on this, so I know exactly what youre going through. Ive fought for search engine traffic, only to have it disappear for no reason during an algorithm shakeup. Ive spent countless hours on feeder sites and backlinks. Ive chased shaky loopholes that only work for a short time, leaving you to find the next shaky loophole. Ive spent good money on traffic without really knowing if it would pay off or not. Sound familiar? Its a real drag. But the online world is a bit different now. Now we have social media sites where your message can potentially reach tens or even hundreds of thousands in minutes... where people share posts that they like with their friends, effortlessly expanding your reach, without you having to lift a finger. Thats called going viral, an amazingly efficient way to accumulate eyeballs that are specifically interested in a niche subject. Of course theres some work involved at the start... but once youve built up a social presence to a certain point, it takes on a life of its own, growing and expanding with very little effort on your part. Think about it... If you had a product you wanted to promote to, say, 15,000 people, and you had no email list, how would you do it? And how long would it take? What if it took 1 minute or less? And then, what if some of those 15,000 people actually shared your message with their friends? Its like your own army of unpaid salespeople.
. . . it was just a photo. Thats right, a single photo... and a very normal photo, actually. Well, there were also FOUR whole words posted in the description. Pretty amazing, eh? Think about if that post had one of your marketing messages in it. And with photos, you dont have the time and technical know-how involved with creating and editing videos. If you want to do those RIGHT, it DOEStake effort. Photos are sooooooooo much easier.
. . . that page was started THIS YEAR. 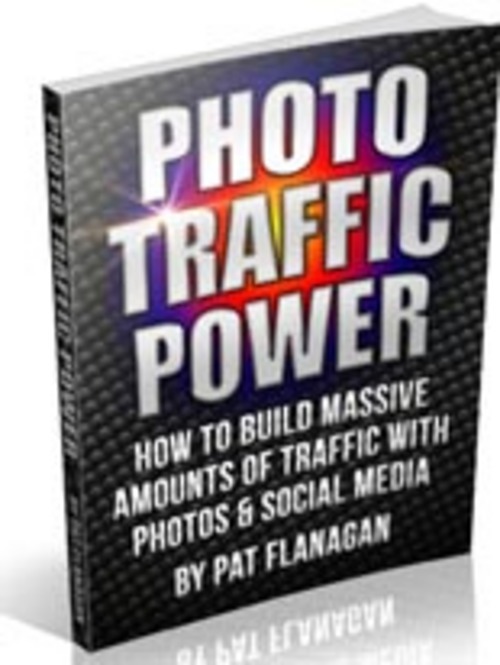 PHOTO TRAFFIC POWER -- How To Build Massive Amounts Of Traffic With Photos & Social Media is a new eBook detailing strategic ways to use photos on Facebook, free blogging sites (Tumblr, specifically) and Twitter to generate huge traffic. Step-by-step instructions and screenshots for setting up Facebook Pages and Tumblr blogs are included, plus case studies of Facebook pages (including the one I just showed you) that are pulling big numbers with photos. Six ways to monetize this traffic youre building -- youll be shocked to see how many high traffic Facebook pages arent doing ANY of them! ...plus suggestions of what to do with the traffic for maximum impact, as well as resources for photos and affiliate programs, all in an in-depth but non-techy easy-to-digest format. Get PHOTO TRAFFIC POWER Now At A Ridiculous Low Price! You can get PHOTO TRAFFIC POWER right now for what youd pay for a medium-quality lunch (maybe Quiznos instead of Subway). A price this low is a no brainer, when you think about the numbers I showed you. With those numbers, a 1/2 response can yield a major income. But dont let the low price fool you, PHOTO TRAFFIC POWER contains quality actionable information that you can use right now to start quickly building up a social media traffic empire with photos.